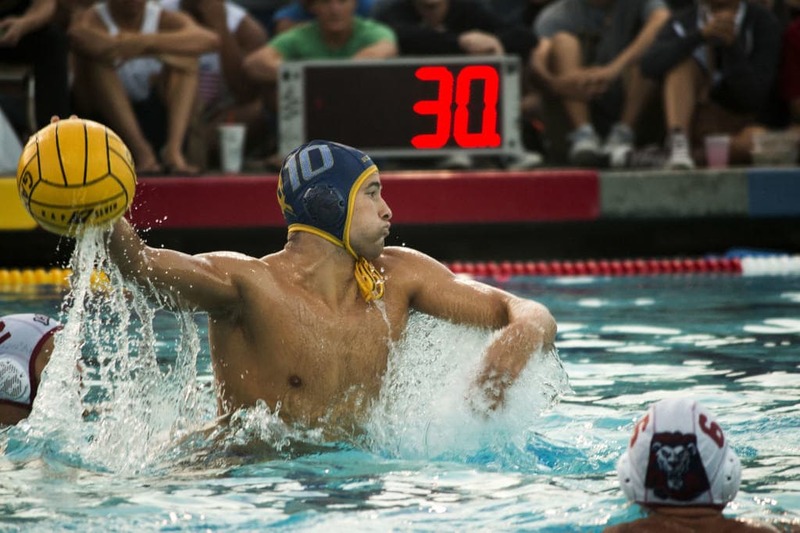 UCSD’s men’s water polo has been the Western Water Polo Association’s team to beat year after year now, and the 2014 season was no different. After besting Loyola Marymount University in the conference finals (12–6) and snagging its 17th WWPA title, the team advanced to the NCAA Championship for the 13th time to face off against the top Division-I programs in the nation. The Tritons earned a fourth-place finish and a No. 6 national ranking after dropping a 20–11 loss in the third-place game against opponent Stanford University, ending the season with a 16–11 overall record and a flawless 6–0 conference mark. Six athletes landed on the WWPA All-Conference list, eight on the conference All-Academic team and three on the ACWPC Division-II All-America Team. Although the Tritons will be graduating several seniors this year, they have a promising group of returners looking to build upon UCSD’s tradition of excellence next season — this team has established itself among the best that Division-I water polo has to offer, and will be a team to watch for years to come. After narrowly losing 67–64 to then-No. 25 Humboldt State at home on Jan. 24, our women’s basketball team went on the road on the regular season’s last weekend and faced Humboldt State again on Feb. 26. UCSD put on a clinic, defeating No. 15 Humboldt State 78–63 in one of the biggest upsets of the year. 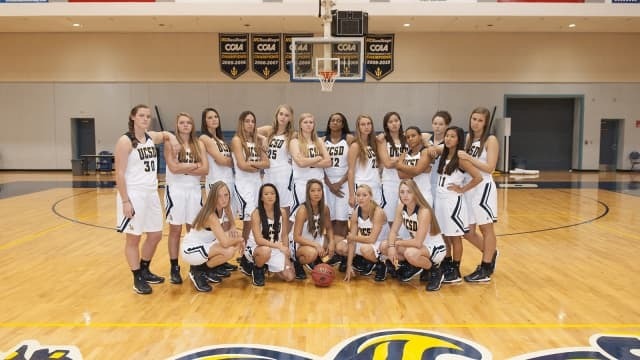 The win itself was impressive, but the manner in which it was done confirmed UCSD as a California Collegiate Athletic Association title contender. Coming in on a five-game win streak, the Tritons took a two-point lead into halftime, 34–32. In the second period, UCSD’s defense clamped down on the Lumberjacks, and the Tritons pushed the ball on offense to open a 10-point lead. They then stood strong on the free-throw line to seal the game. 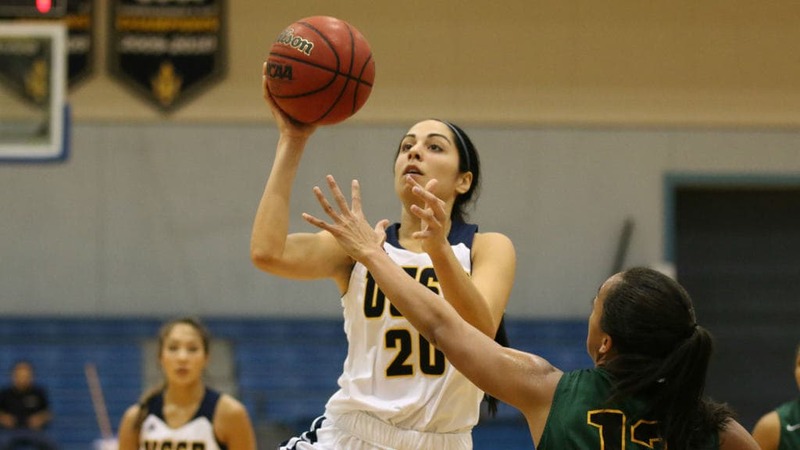 UCSD thrashed Humboldt on the board and limited them to less than 35-percent shooting. Junior forward Farrah Shokoor led the Tritons (20 points, 16 rebounds and four blocks) to their most impressive win of the year. 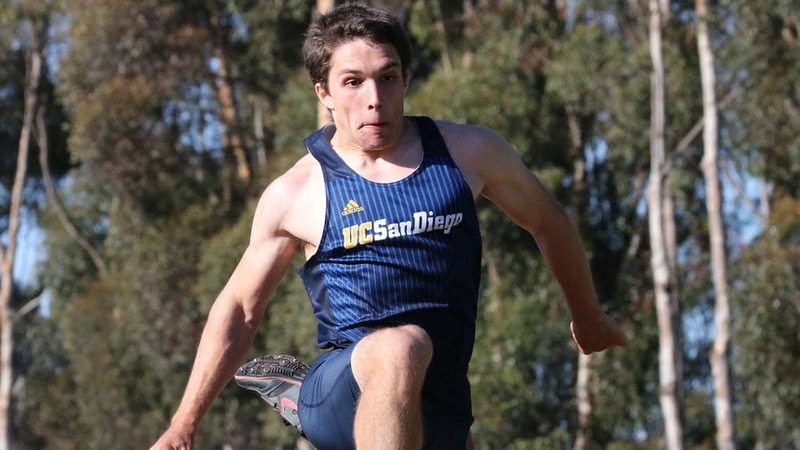 The UCSD men’s track and field team ended Chico State’s 11-year first-place win streak at this year’s CCAA Championships held at San Francisco State’s Cox Stadium. After bouncing between first and second place over the three-day meet, the Triton men trailed Chico State 212–204 with one event left. In the pole vault, fifth-year Clint Rosser, sophomore Dan Golubovic and junior Tim Schmidt earned 12 points for the Tritons, putting them in first place and ultimately giving the Tritons their first-place finish. 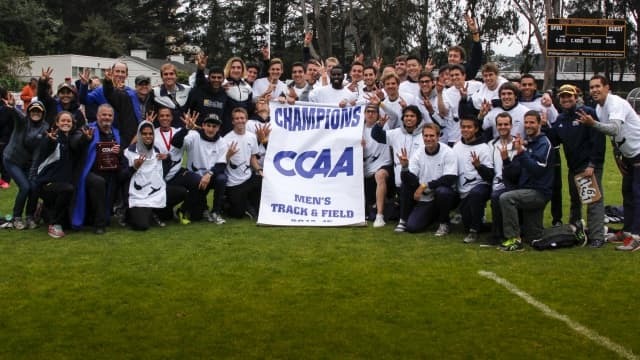 Several podium finishes by the Tritons — including a first-place finish by three-time CCAA champion in the javelin senior Nash Howe, first- and third-place finishes in the triple jump by freshman Matt Bowen and sophomore Derek Van de Streek and first- and second-place finishes in the 400 by senior Connor Macky and sophomore Jared Senese — solidified UCSD’s well-deserved win. With many returners, the Tritons will be sure to put up a good fight next season. With the considerable success he and his team have had this season, Denny Harper is undoubtedly one of the most notable coaches at UCSD. Harper led the Tritons to a 16–11 overall record this season, finishing with a perfect 6–0 conference mark and earning his 17th WWPA Championship title and a fourth-place finish at the NCAA Championship. In his 35 years in charge, Harper has amassed 601 wins, earning his milestone 600th win at this season’s WWPA Championship. This season also marks Harper’s 18th WWPA Coach of the Year and eighth NCAA Division-II Coach of the Year titles. 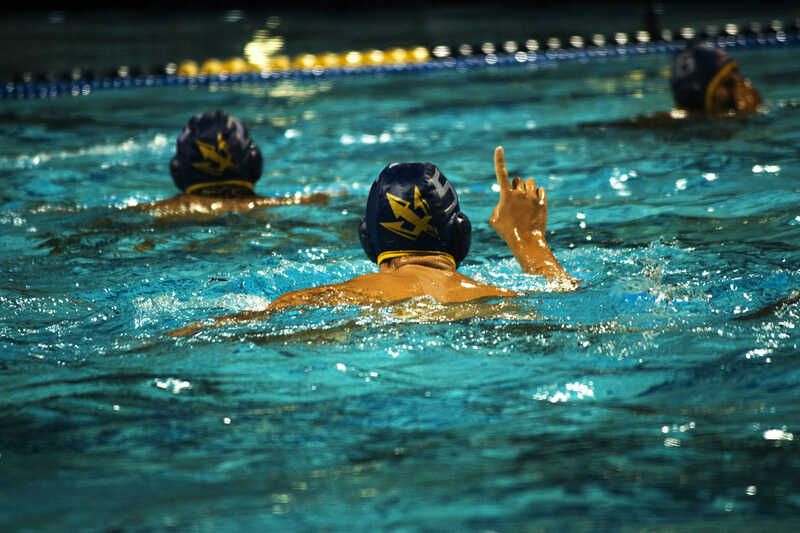 Since taking the lead, Harper has held UCSD at the top of the WWPA — in 28 seasons, the Tritons have earned 17 conference titles and 11 runner-up awards. Harper and his team are ones to watch in upcoming seasons and will surely be a force to be reckoned with at the conference and national levels for years to come. Junior right-handed pitcher Justin Donatella, a hopeful for this year’s Major League Baseball draft, put up one of the best single-season performances ever for a Triton pitcher. A consensus All-American, Donatella led his team within one game of the NCAA Championships in Cary, North Carolina. 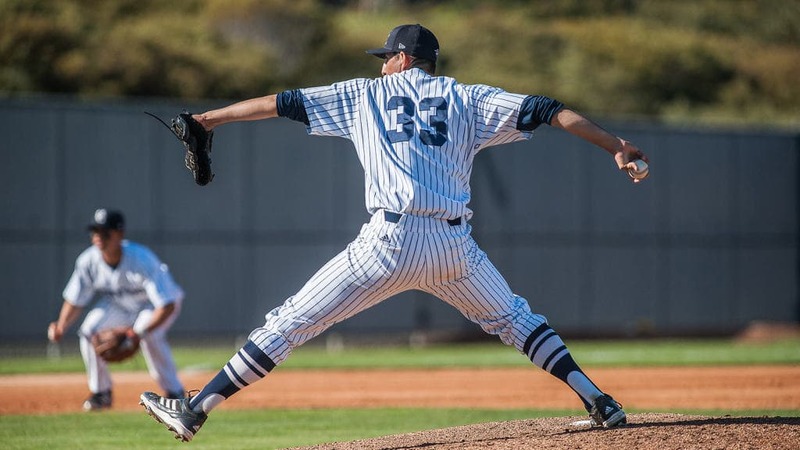 The junior already possesses a flurry of awards for this season, including the National Collegiate Baseball Writers Association National Pitcher of the Year and the consensus West Region Pitcher of the Year. Donatella holds a 9–3 record in 14 starts. He had a school record 1.74 ERA, league-best 111 strikeouts and .186 opposing batting average, while walking only 17 in his 88 innings pitched. His ERA was below 1.00 for most of the season, with a season low 0.28 in March, which would place him first amongst Division-II pitchers (Miles Sheehan from Franklin Pierce University ended the year with a 0.29 ERA). His 31.2 consecutive shutout innings to open CCAA play led the baseball team to a fantastic season. Women’s water polo goalie Courtney Miller, a junior hailing from Honolulu, Hawaii, made the Tritons an exciting team to watch on the national level as she helped lead UCSD to the NCAA Championships this past season. With Miller being at the heart of crucial plays, the Tritons placed eighth in the Championships. In their opening round game, Miller had 15 stunning stops in the cage against No. 1 UCLA. In the WWPA Championship match, Miller, who was also honored with WWPA All-Tournament First Team, held Cal State East Bay to eight goals while blocking seven shots, and launched the counter-attacks which eventually led the Tritons to the WWPA title. Prior to winning the title, Miller was also awarded WWPA Player of the Year. This season, Miller finished with 402 stops which set a single-season record for UCSD, and she also managed to break UCSD’s all-time saves record and now currently holds the top spot with 1,131 career stops. With another year left at UCSD, there is great anticipation for what Miller will be able to accomplish. A transfer from San Francisco State University, junior forward Farrah Shokoor took the league by storm in her third season of CCAA play, earning First Team All-CCAA recognition and the Daktronics Division-II All-West Region Second Team. In her first year playing with the Tritons, she led the team in scoring average (13.1 per game), rebound average (12.5 per game), blocks, steals and free-throw attempts. In a team that graduated six seniors this year, Shokoor was the one to lead the charge in many games, bringing UCSD to a 16–6 record in CCAA play, good for fourth in the conference. Shokoor had 15 double-doubles this year and had several very impressive stat-lines, like her 20 points, 16 rebounds and four blocks game to down No.15 Humboldt State. She anchored UCSD’s offense and defense through a tough schedule and to a very successful regular season. With three starters graduating, Shokoor’s role will only get bigger next year as she tries to lead UCSD to yet another CCAA tournament berth. After redshirting the 2013 season, Stiling returned to the pool and capped off an impressive collegiate campaign with a slew of strong performances and conference accolades. The 6-foot-4-inch Oregon native concluded the postseason with 16 goals, six assists, eight steals and four ejections drawn, and ended his career with a team-high 72 goals, 13 hat tricks, 48 steals and 188 all-time goals — the eighth-best in UCSD history. He tied a season-high six goals and recorded one steal and one ejection drawn in the NCAA play-in game against Brown University and ended his final game against Stanford in the NCAA Championship with four of the Tritons’ 11 goals and one steal. Stiling was awarded Association of Collegiate Water Polo Coaches Division-II Player of the Year, Division-II All-America First Team, Division-I All-America Second Team, NCAA All- Tournament Second Team, WWPA Player of the Year, WWPA All-Tournament First Team and All-WWPA First Team, among numerous other honors. Though his time as a Triton has ended, Stiling has left an incredible legacy in the pool and is undoubtedly among the UCSD greats. Fresh out of Buchanan High School in Fresno, California, track and fielder Matt Bowen has already made a huge impact on the team. Excelling in the triple jump, Bowen earned several accolades for his performance this season. In one of his first meets of the season, he jumped nearly 50 feet, placing him on UCSD’s all-time record list. He would go on to win the event at the CCAA Championships, contributing to the Triton men’s incredible first-place finish, as well as to qualify for the Division-II NCAA championship meet. At the NCAA meet, he broke his own second-place school record with a jump of 50-5 1/4, which also earned him All-American status, an astounding feat for a freshman. Bowen was also the unanimous recipient of the 2015 CCAA Freshman of the Year award and also earned honors from the U.S. Track and Field Cross Country Coaches Association for his record-setting ways. Bowen will no doubt be a crucial component to UCSD’s track and field team for the next few seasons.